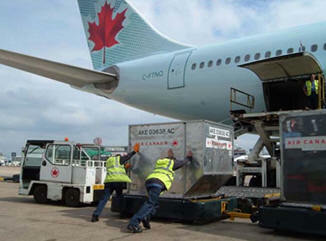 June 4, 2012 - The United States and Canada on Thursday announced that both governments have agreed to the mutual recognition of, and cooperation on, air cargo security in both countries. Mr. James D. Nealon, Deputy Chief of Mission at the U.S. Embassy on behalf of Transportation Security Administration Administrator John Pistole and the Honourable Denis Lebel, Minister of Transport, Infrastructure and Communities, made the announcement. Various studies have examined the economic impact of the so-called thickened border. Even the most conservative estimates put direct border costs to the Canadian economy at an amount equivalent to one percent of our gross domestic product, or $16 billion a year. This means that even a modest improvement of border efficiency would result in significant savings to the Canadian economy. The U.S. and Canada are each other's largest single export market. Trade between Canada and the United States has almost doubled since 1994 and is now worth more than half a trillion dollars a year. More than $1.5 billion in goods crosses the border every single day. Millions of jobs in both countries depend on the trade and investment that flow daily across the border between the two countries. “With our vast geography, Canada’s economy relies on the safe and efficient movement of goods by air. Mutual recognition of air cargo security programs will improve efficiency and cut costs for businesses and consumers on both sides of the border,” said Minister Lebel. In Canada, almost half of all air cargo is shipped on passenger planes, which is the most effective shipping method, considering Canada’s size and unique geography. Last year, approximately 100 billion dollars of goods were imported and exported by air. The Perimeter Security and Economic Competitiveness Action Plan, published in December 2011, establishes initiatives to improve the ability to manage security risks in both countries, while reducing the burden on business. The action plan focuses on four areas: addressing threats early; facilitating trade, economic growth and jobs; integrating cross border law enforcement; and strengthening critical infrastructure and cyber security.